Surgery day finally came. The entire time from getting to the hospital & waiting til surgery time was uber stressful. I'm sure it had absolutely nothing to do with the fact that Drool Prince's monitors were alarming every few minutes - *missed beat*, *HR low* (our great nurse from Thurs nite tried to fix that by lowering the rate it'd alarm at down to 50 instead of 60 (which ironically had already been lowered from 70) but Drool Prince just decided to beat it and went below 50bpm), *pvcs*... you get the picture.. Finally the alarms were silenced so we could sleep but in the dark you could still notice when it would alarm b/c it'd flash.. Surgery time finally came around 1pm. I'm glad we were fit into the schedule b/c otherwise that meant us staying in the hospital over the weekend and getting surgery sometime the following week. They were not letting us out of the hospital until it was fixed. Drool Prince was a champ- he went back into surgery without crying at all. He did question why we couldnt' go with him but finally consented when we assured him that we'd be waiting for him to come out. Apparently he was cracking up the entire surgical team up until the time he went to sleep. 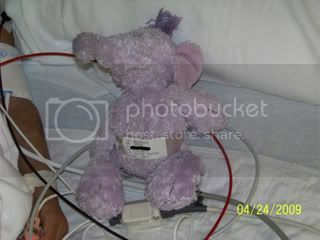 Drool Prince took his favorite Lumpy (heffalump from Pooh) with him into surgery & Lumpy came back out w/ his very own arm waist band! Daddy Chaos & I ran downstairs to McD's (bye bye diet..) to grab a bite to eat since none of us had eaten since 6pm the nite before. Drool Prince was allowed nothing due to not knowing when surgery might be and we weren't leaving him to get something , even in shifts, because neither of us wanted to be gone when he went down for surgery. I have no clue why surgeons ever give an estimate on how long a surgery will take. 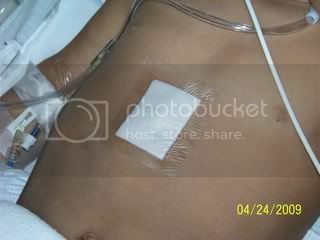 His first heart surgery @ 3mo was supposed to take 3hrs but took over 5hrs. This time we were told about an hour.. NOT.. Almost 3hrs later we finally got to go back and see him. Surgery went well. They removed the old lead, put in a new one & were even able to use the same incision as before so -no new scars! The actual pacemaker still has at least 5yrs of life left on it so it wasn't replaced. Drool Prince was kept pretty doped up the rest of the day/nite. He could barely open his eyes and spoke maybe 3 sentences the entire time. Everyone was glad it was finally over & all was well. Daddy Chaos took Baby Bug and went home so he could get down and play.. ok so that was the excuse used, we all know Daddy Chaos just wanted to sleep in his own bed again.. brat.